Tasting in honor of Laphroaig Live 2012, five proposed whiskies. I have all of them but Ardmore so I will taste three Laphroaigs and Connemara. I missed the online event for a matter of hours so I sorted the whiskies as I though it could be best. I think that the drams has been sorted slightly different on the online tasting with Connemara and Ardmore being tasted in last place. 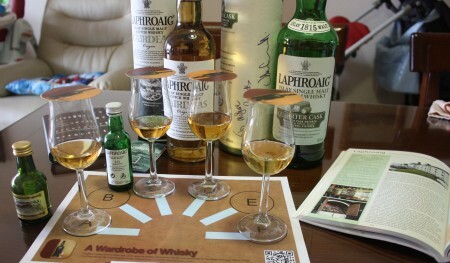 A very interesting peated tasting and I have delicious peat smell in all the room while I am writing this post. Palate (92): powerful, oily. peat, honey, pepper, salt, seaweed, earth. More salty than the other Laphroaig whiskies that I have tasted. Finish (91): longer than average. peat, honey, spices, sea, salt. So based on other whiskies I have already tasted I rate this Laphroaig Cairdeas Origin with 91 points over 100. Laphroaig 10 years old is a solid peat experience and for a very fair price and this year Cairdeas whisky is so good that remind me of the old 10 years old Cask Strength single malt. Powerfully salty! 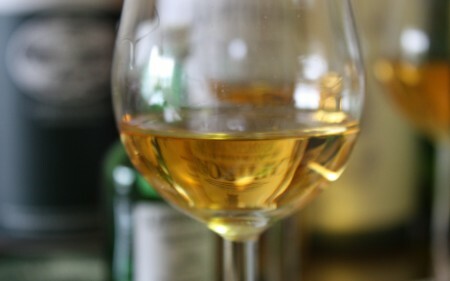 Connemara is a nice whisky but it is far from its Islay companions.